Hosting a summer picnic is a great way to throw a party to remember but it does take a fair bit of organisation and preparation. We’ve all heard disastrous picnic stories, but you can make sure your picnic isn’t one of them with for a grand day out. You’ll be the al fresco hostess with the mostess. The key to a successful picnic is a winning location. Avoid wind, busy roads and wasps at all costs. Scout out a good location well in advance, picking somewhere picturesque, quiet and safe for any little guests. Remember to cater for sun worshippers and shade lovers and find a place where friends and family can flop down under a tree to escape the heat of the sun. A few large trees will also provide shelter if the worst should happen and the heavens open. Stop children getting bored by arranging games, like rounders or Frisbee. A football or bat and ball set will bring hours of fun for kids and grownups alike and will help everyone to work up an appetite. Forgetting the basics can ruin a picnic so make a list of the essentials and make sure you pack them first. Plates, cutlery and cups are the obvious ones, but you’ll also be very glad of antibacterial hand spray or wipes, tissues and ice packs to keep food and drinks cool. Most importantly remember to pack a basic medical kit and plenty of sunscreen. Reapply it regularly to your own skin as well as your kids’, even if you think you’ll spend most of your time in the shade. Hosting a picnic doesn’t necessarily mean supplying all the food. Avoid a shock at the supermarket checkout by delegating to your guests, asking them to each bring a selection of finger food and something to drink. sharing the load like this also means everyone will find something they enjoy, and you won’t have to worry about catering for diets, food allergies or fussy eaters. Ask guests to bring rugs or seating, too, so that you won’t all be squashed together on the same patch of damp grass. Take plenty of carrier bags along to your picnic so you can pile all your leftovers and rubbish into them before you leave. In the absence of rubbish bins you’ll at least avoid spreading food all over the boot of your car on the way home. Packing all the leftovers away when you’ve finished eating will help to make sure you don’t attract unwanted guests like flies and wasps which are guaranteed to scatter your party in moments. Picnics are a great British tradition and there’s nothing more wonderful on a warm, sunny day than the sound of fizzing lemonade and the taste of fresh strawberries on your tongue. 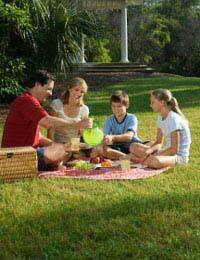 With a bit of preparation and thought you can host a summer picnic that brings people of all ages together in the simplest of ways.